Relax on the Deck, Patio or beach and watch Dolphins frolicking in the waves. 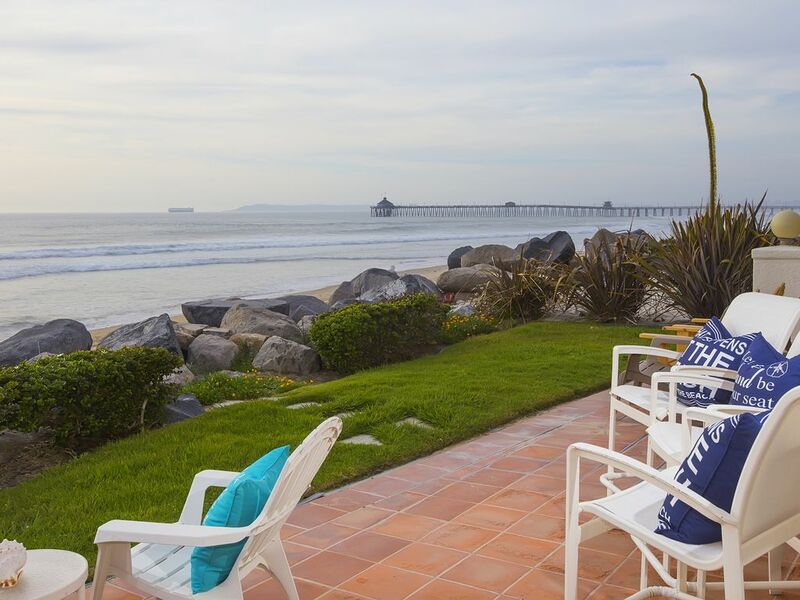 This first-floor, luxury, oceanfront condominium features a private oceanfront deck, patio and beach with spectacular views of the San Diego skyline to the Coronado Islands. Private steps take you to the sandy beaches with the Pacific Ocean within a few feet. Located within minutes of all of San Diego"s Venues. Call us for more details wonderful details! This beautiful home features a family room, gourmet kitchen, and the living room offers spectacular views of the Coronado Islands, Point Loma and Incredible sunsets. This condominium is ideal for Corporate meetings and extended family vacations. We are conveniently located close to the Hotel Del Coronado, the San Diego Convention Center and Petco Park. Visit one of the 60 San Diego golf courses, the San Diego Zoo, Balboa Park and Museums, Sea World, Seaport Village, Wild Animal Park and Lego-land to mention a few. Enjoy Surfing, Boogie Boarding, Fishing, Hiking, Golfing , Bike Riding, Sailing and Relaxing on the beach. Just a few steps from the beach and ocean. Enjoy spectacular sunsets and views. Take long relaxing walks on the beach. Collect San Dollars and beautiful sea shells. Just steps to the beach and ocean. Enjoy long walks on the beautiful beach or relax after a long day sightseeing. Surf, Fish Boogey Board. All within a few feet of your home! Enjoy the spectacular views and incredible sunsets from the deck and patio. Watch the Dolphins and Pelicans while enjoying your favorite beverage. Great surfing! Spend the day walking the beach and collecting sand dollars. Unforgetable sunsets!! Fantastic property. Clean. Well stocked. Best location ever. Not one complaint. I will be back. and our spectacular beach community. We are proud have the opportunity to provide our guests with wonderful memories of San Diego and Imperial Beach. My family enjoyed this place it was comfortable and so peaceful. The beach seems private never over crowded. I didn’t want to leave. We really enjoyed your visit to your beach home away from home. We are blessed to have the opportunity to introduce our wonderful visitors to San Diego to a peaceful, tranquil, small town beach environment as Imperial Beach is. We hope you will remember us and our home for future visits. Stayed for 1 week and did not want to leave. We had a VERY enjoyable stay at Imperial Beach. The living space was clean, the beach was beautiful, the neighborhood was good and the weather was great. We have family in the area who warned us of something Californians call “June Gloom” which, to those of us who live in the Midwest is a fancy to say mid 70s and sometimes partly overcast. We found it to be very comfortable. The place was stocked with everything you’d need so that all we needed to bring was clothing, personal items and food. Plenty of grocery shopping options around as well so getting food was not a problem. We have family in the area who expressed concern about the quality of the beaches due to the Tijuana river sewage problem. We figured that if we had to travel to better beach conditions, that would be the case no matter where we were staying. Beach front or otherwise. It was not a problem at all. The water quality was great. We watched dolphins jumping and playing and walks down the beach to the Imperial Beach Pier were very enjoyable and relaxing. The kids loved it! We would definitely recommend this place and we would definitely come back here again. We want to thank you for the great review of "Imperial Beach" and our beautiful home away from home! You have highlighted the best attributes of Imperial Beach. Small town atmosphere with friendly neighbors in a beautiful sleepy beach community. See all of the sights in San Diego and come home to relax on our beach! We would love to have you come back to see us in very the near future! Wonderful property, excellent location, and very helpful and courteous owner at a very fair price. The location and setup is fantastic. The other bonus is the Imperial Beach area is relatively quiet and low key. The only reason I did not give it a 5 star is that on the floor we were on, there was no privacy with the adjoining unit on the back outdoor porch. If you are not compatible with your neighbors (i.e. adults looking for quiet evening to watch the sunset and sip a glass of wine versus families with young energetic kids), it can keep you indoors when you'd rather be outdoors. If the owners of the building did a project to add some privacy or separation between the units on the porches, it would enhance the property's appeal. The owner was very helpful and very responsive before and during our stay. Would come back for sure. Thanks Alex! Stays are Saturday thru Saturdays only Stays over 30 days will be calculated from applicable rates. Rates are subject to change until reservation is confirmed. We have a $750 security/cleaning deposit. In order to provide a clean environment and refresh the home for you we require $175 to clean after your visit. $500 is refunded directly by VRBO after we inspect the home. Cancellations & Refunds: No refunds will be made less than 60 days prior to your stay. Owners will allow tenant to choose another date based on availability.